I can't even begin to explain to you how important this trip was for my family. My husband works a lot (100+ a week hours and I'm not exaggerating) because he's starting a few businesses while working full time at his current job, and I am so proud of him but the kids and I have missed him. This weekend we put our phones away, we laughed, we told jokes, we napped, we ate junk food and stayed up way too late and most importantly we made memories that will last a lifetime. Riley and I have decided to make this an annual trip, not as our big vacation but as a small weekend getaway, because we all loved it so much. Honestly, I didn't think we would love it as much as we did, I knew we'd enjoy it but it had something for everyone and it was an easy, relaxing trip. Owen loved staying at a hotel, Emmalyn loved every single second, and the adults enjoyed the roller coasters and watching the kids explore. 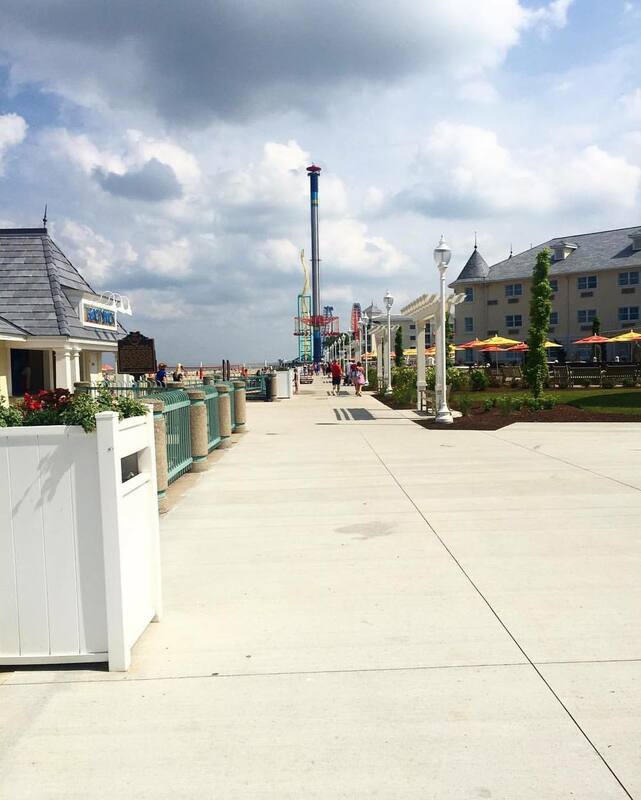 We stayed at Hotel Breakers at Cedar Point where we had access to Lake Erie and the beach, walking distance to the park, 5 restaurants, Starbucks, an arcade, and a few pools. If that wasn't enough, we also had two day tickets to Cedar Point and the water park, Soak City. We arrived on Friday and once we got checked into the hotel we headed straight to the park to explore the rides. The lines were oddly short so my mom and Riley took advantage and rode some of the bigger rides while I explored kiddie land with E & O. Emmalyn tried her first roller coaster, which was amazing!!! Owen is our little daredevil - he wanted to ride everything. He cried when he saw his daddy and Gigi on the Magnum without him, hahaha! The highlight of Friday night was when Emmalyn begged to play a game where you climb this impossible ladder to hit the buzzer and you win a giant prize, all she wanted was this unicorn! (Pictures below) We explained to her that we might not win and we have to accept that...but that was until Riley tried to climb it once and was then determined to win this unicorn for his girl, about 16 tries, and $40 later, he won and we all cheered so loudly!! The whole park probably heard us. Emmalyn spent the rest of the night walking around with her Riley, and her unicorn with a huge smile and it was worth every single dollar. Saturday we used our early access pass to the park and Riley and I went on one roller coaster (I'm not a huge fan but he is) while my mama took the kids around kiddie land. We had ice cream for breakfast, and then explored a whole new kids area that we had never discovered. We also explored Soak City which was fun. Saturday night we were all ready for real food, the park food just wasn't cutting it anymore, so we headed to Bay Harbor at the Cedar Point Marina for a delicious dinner and it made us all so happy and re-energized we headed back to the park until midnight when they closed. We felt like the worst and best parents all at once.